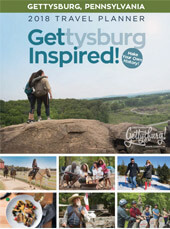 The history of Gettysburg is undoubtedly one of the biggest draws to the area. It can be experienced through an up-close and personal tour of the battlefield or a stroll through a museum. However, it can also be experienced through the palate. If you are looking to expand your historical experience in Gettysburg, beyond the battlefield, be sure to check out these Gettysburg area restaurants that offer historic dining experiences, historic food options and a general history-rich atmosphere. Step inside the Dobbin House Tavern, one of Gettysburg’s oldest and most historic structures. The colonial-era restaurant has humble beginnings as a family home built by Reverend Alexander Dobbin in 1776 in hopes of a new life in America for himself and his family. Today, the structure is listed on the National Register of Historic Places, and is one of Gettysburg’s most authentic period-style dining experiences. Dine upstairs, in the Alexander Dobbin Dining Rooms, where guests can enjoy a candle-lit, fine dining experience, or head downstairs to The Springhouse Tavern for a more casual dining atmosphere, among three natural springs and two glowing fireplaces. No matter where you dine in the Dobbin House, enjoy tasty fare brought to you by period-dressed servers. The Historic Farnsworth Inn is steeped in history. The original part of the house was built in 1810, followed by the brick structure in 1833, and would go on to play a role in the Battle of Gettysburg. Confederate sharpshooters took position in the home’s attic during the three-day battle, one of whom is believed to have fired the bullet that accidentally hit Jennie Wade, the only civilian killed during the Battle of Gettysburg. Like many buildings in Gettysburg at the time, following the battle, the Farnsworth House served as a hospital to wounded soldiers. Today, patrons can view more than 100 bullet holes that cover the exterior wall of the structure, a reminder of what took place in this town, just over 150 years ago. Dine on Civil War era meals such as game pie, peanut soup and spoon bread that are brought to guests by servers appropriately dressed to fit the era. Enjoy a more formal dining experience in the Meade and Lee Dining Rooms inside the historic inn, or for a more casual experience, head to Sweney’s Tavern that includes indoor and outdoor seating. Located at the foothills of the Appalachian Mountains, only nine miles west of Gettysburg, Hickory Bridge Farm and Restaurant offers delicious, family-style dinners with a touch of Pennsylvania Dutch. Hickory Bridge Farm’s history goes way back, to the late 1600s. The current owners acquired the property in 1977, and have operated and grown the business since then. Take one step inside the beautifully restored, 160-year-old barn-turned restaurant and you’ll feel the history around you. Antiques cover the walls of the barn and, when in season, flowers from the farm’s own garden are placed on the tables. Make a weekend out of your trip to Gettysburg’s countryside and stay at one of Hickory Bridge Farm’s suites or cottages. With origins dating back to 1757, The Historic Fairfield Inn has an amazing history. It is one of America’s oldest, continuously operated inns. In it’s time, the building has served as a Civil War hospital, a colonial meeting house, a stagecoach stop and part of the Underground Railroad. The ambiance of the dining room and delicious, historic fare transport guests back in time. The menu features many period dining options including ham and bean soup that was served to confederate soldiers as they retreated after the Battle of Gettysburg, as well as chicken and biscuits, a recipe that has been passed down over many years. The Inn at Herr Ridge was established in 1815 and operated as a tavern until 1828, when it was acquired by Frederick Herr. Herr continued to run the property as a tavern, Herr Tavern, but also as lodging for travelers and as a major stop along the Underground Railroad. Herr Tavern found itself in the midst of the first day of the Battle of Gettysburg and became the first Confederate field hospital. Today, guests can enjoy a fine dining experience in the historic structure, as well as stay overnight in the Inn, including in three rooms that served as surgical rooms during the Battle of Gettysburg. Before the Federal Pointe Inn was a boutique hotel, the building served as a local school for the children of Gettysburg. The Meade School opened in 1897 as a high school and later operated as an elementary school. Renovations began in 2012 after owner Peter Monahan had plans to turn the school into a hotel while still keeping the charm and look of the Meade School. In the basement which used to hold the school’s cafeteria is the Federal Pointe Pub. Signs from the old school hang on the walls, as well as several original slate chalkboards, class photos, a wind-up phone, a flag in the corner and the school’s bell. Pub patrons can dine on signature pub dishes and choose from the extensive drink menu which features local craft beer, wine and spirits. I think you should add the Cash Town Inn, very historic and the food is to die for. Another great, historic place in the Gettysburg area! Thanks Joe! Absolutely! We have a little bit of everything.